This class defines how to read and write freesurfer ASCII surface format. To use IO factory, define the suffix as *.fsa. Definition at line 36 of file itkFreeSurferAsciiMeshIO.h. Definition at line 45 of file itkFreeSurferAsciiMeshIO.h. Definition at line 46 of file itkFreeSurferAsciiMeshIO.h. Definition at line 43 of file itkFreeSurferAsciiMeshIO.h. Definition at line 48 of file itkFreeSurferAsciiMeshIO.h. Definition at line 44 of file itkFreeSurferAsciiMeshIO.h. 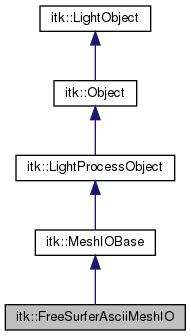 Determine if the file can be read with this MeshIO implementation. Returns true if this MeshIO can read the file specified. Determine if the file can be written with this MeshIO implementation. Returns true if this MeshIO can write the file specified. Definition at line 142 of file itkFreeSurferAsciiMeshIO.h. Definition at line 120 of file itkFreeSurferAsciiMeshIO.h. Definition at line 104 of file itkFreeSurferAsciiMeshIO.h. Definition at line 168 of file itkFreeSurferAsciiMeshIO.h.